Start your caffeinated Christmas countdown with the limited edition Beanies Flavour Coffee Advent Calendar! With 46 sticks behind the doors, you can enjoy two delicious cups of flavoured coffee every day to Christmas. And there is an extra surprise hiding behind door number 1 and door number 24! It’s the perfect alternative advent calendar. 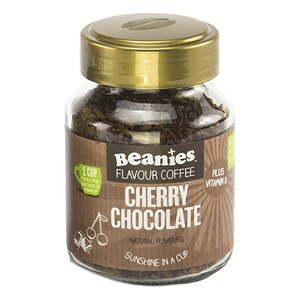 Why Choose Beanies Coffee Advent Calendar? Beanies are the coffee specialists. They have been creating flavour coffee since 2009. All of Beanies flavours are just 2 calories per cup, with no added sugar, sweetener, or anything else besides. From scrumptious caramel to a spicy mulled wine, what flavours will you get? 2 Calories per cup & Sugar free! 46 sachets, 1 full jar AND a travel cup! Have 2 sachets per day to keep you going through December in your amazing Beanies Travel Cup!